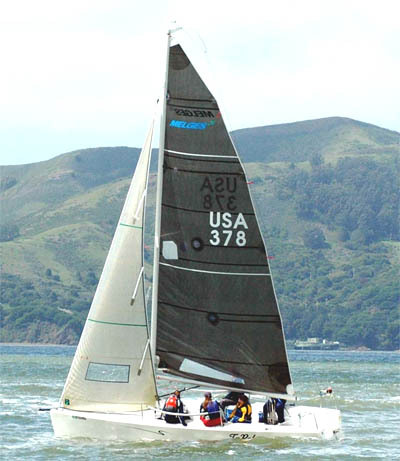 The Melges 24 was designed by the San Diego-based team of John Reichel and Jim Pugh. I have not had the pleasure of looking at any Reichel/Pugh designs in the past, although their office has been busy and quite successful in the high-performance end of the business. Let's take a look at the history of this influential design office before we get into the specifics of this highly-interesting design. The R/P design team has been involved with the last two America's Cup efforts, in 1989 with the Beach Boys' USA syndicate and this last time with the Bill Koch team. They have produced a very effective series of International 50-footer class yachts, winning nine of the last 13 regattas. Currently the R/P 50 Champosa VII leads the 50-Foot World Cup by 4.5 points. R/P knows performance boats. For many sailors one-design racing is the ultimate form of competition under sail. 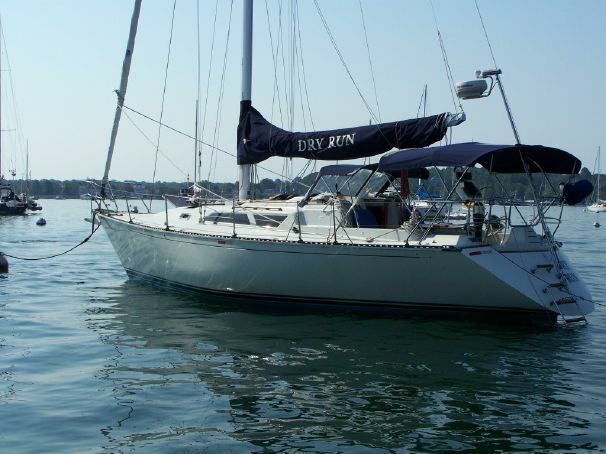 In theory, everything is equal except skipper and crew, so rules are devised to prevent a skipper from throwing money into his boat until he buys an edge in boat speed. With all the established one-design classes out there, why complicate things by introducing another? Obviously, we know more about design and performance than we did when the Soling and Etch ells were designed, so in the designer's mind there is always room for a new, more advanced type of one-design boat combining all the latest design innovations. Speed is the goal. 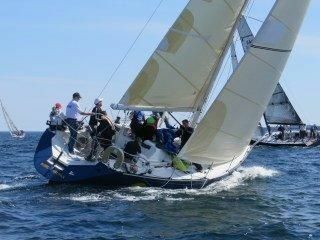 L. Francis Herreshoff said that the enjoyment you get from sailing is a function of the speed you go. That's a simple way to look at a complex pastime, but I think we can all recall a certain power reach or plane down the sound where our every fiber was tuned into being at one with the boat as it performed at the very limit of its potential. 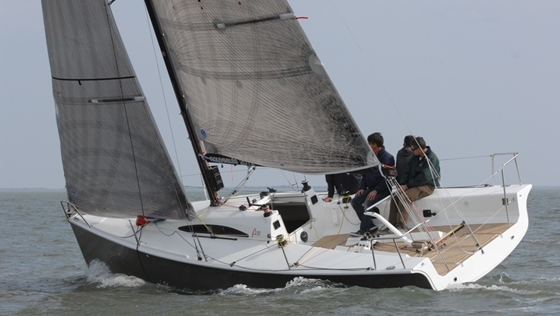 The R/P-designed Melges 24 has a near-flat bottom with a firm turn to the bilges and considerable flare to the topsides. The deck edge/sheer is radiused, and the stem is near-vertical with the bow knuckle just clear of the DWL. The D/L is 64.63. The basic shape is one that should plane easily off the wind. The drop keel can be pinned in one of three positions. You can pin at five-foot draft or four-foot draft (if the area demands less operating draft). You can also pin the keel in the up position for transporting. 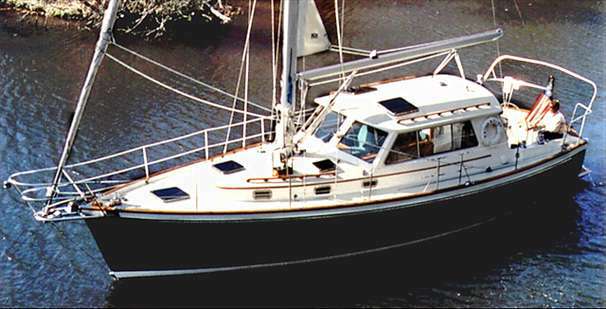 The keel is not designed to be moved when you are underway. The minimal area fin features a large ballast bulb at the tip for stability. The rudder is extremely deep and narrow with an 11 percent thickness ratio. Note the reverse sheerline to this design. This is a way of getting additional volume below, and I think it also adds a snappy look. We are breaking new ground this month: this is the first design we have looked at with a SA/D ratio over 30. The SA/D of this design is a whopping 35.53. Maybe the crew should wear all leathers to guard against abrasion should they fall overboard. With that kind of horsepower per pound at your disposal, you can expect blistering light air speeds from this design and a wild ride in a breeze. 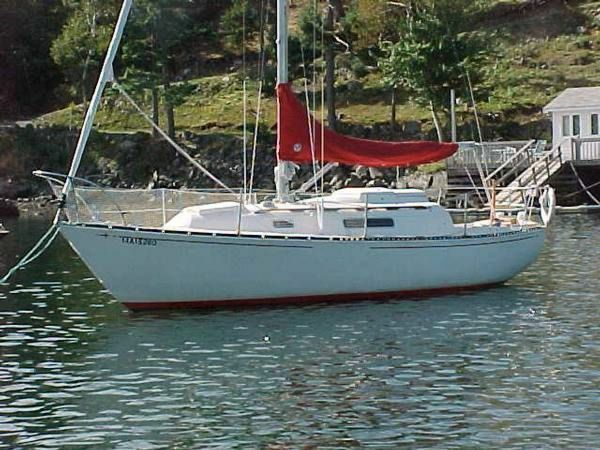 The 24 carries a retractable bowsprit for asymmetrical spinnakers. I suppose this boat will always be going fast enough to pull the wind ahead enough to make a symmetrical chute useless. The sheeting angle for the jib is nine degrees. This sheeting angle pushes the small house proportions to almost a turret-like appearance. The mast hinges at the deck to facilitate transporting. 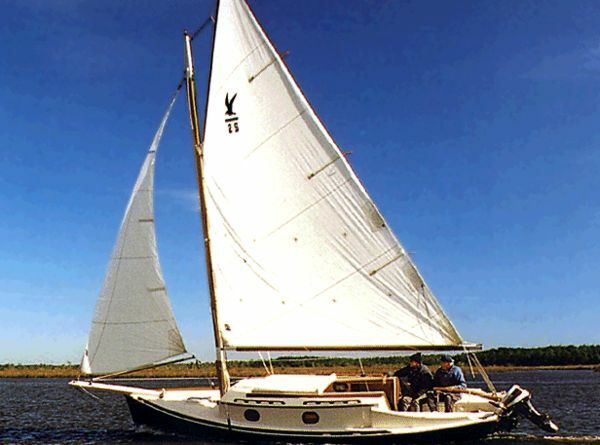 The jib is roller furling with the drum recessed into the foredeck. The shrouds are well outboard with the loads carried to the maststep by way of diagonal tubes connecting the chainplate web to the transverse floor at the mast. The plan view shows an interior layout of sorts, with a portable head under the companionway step. There are V-berth and quarter berths. You could sleep below, but it would help if you were bone weary from a hard day of around-the-buoys racing. I doubt that you would gather below with the crew for a drink and a discussion of your gybe set during the third race. This interior looks to me to be a place to keep your lunch and your headsails. 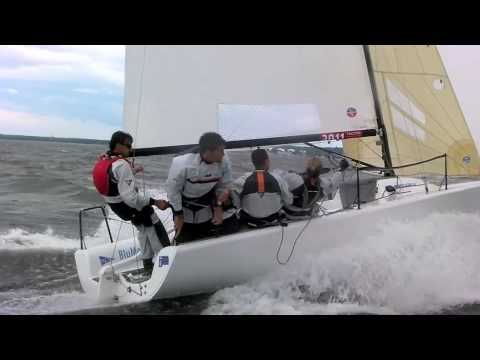 The Melges 24 was successful at combining dinghylike speed with the stability of a larger boat. If the J/24 marks one leap forward in the development of 24-footers, then the Melges 24 is the next big leap. We can now watch the rest of the industry try to catch up. But we'll have to wait and see if the 24 has that magical combination of attributes that will make it a successful class. Sail Area 349 sq. ft.